The What: Harman has announced the new AMX N2300 Series of 4K video over IP solutions. This addition to AMX’s existing range of 4K products adds a cost-effective 4K video distribution solution for many common applications. With a bandwidth of less than 200 megabits per second, users can distribute 4K video over existing gigabit ethernet networks with a latency of only one frame. The What Else: The new AMX N2300 Series comes in addition to the existing AMX N2151/N2251 encoders and decoders, which offer JPEG2000-based 4K Networked AV distribution. AMX ensures simple installation of the N2300 Series with support for HDMI 2.0 and HDCP 2.2, making the line compatible with the latest 4K sources and displays. “Implementation of the AMX N2300 Series is as easy as ever,” said Paul Krizan, product manager, networked AV for Harman Professional Solutions. “The use of the IP network for distribution allows for flexible and scalable system designs. Systems can be as small as a single encoder and decoder or grow to meet the requirements of a larger system simply by installing additional units.” The N2300 encoders and decoders are PoE powered, avoiding the need for an external power supply and thus simplifying installation. The products do not contain an internal fan for cooling, making them perfect for use in quiet environments. “The AMX N2300 Series leverages nearly a decade of expertise in Networked AV solutions,” Krizan said. 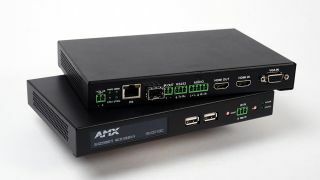 “Users familiar with the existing Harman Networked AV products will find these new products very familiar, as they include the same APIs, software, and web interfaces as existing Networked AV products.” Like other AMX Networked AV products, the N2300 Series has Native NetLinx capabilities for fast integration into Harman solutions. Additional features include keyboard/mouse support, RJ-45 and SFP network connections, support for balanced and unbalanced analog audio, and RS-232 and IR ports for device control. The Bottom Line: The NMX-DEC-N2322 decoder is available as a standalone unit perfect for mounting behind a display. The NMX-ENC-N2312 encoder is available both in standalone and card-based configurations, providing options for installation near a source or in a rack, using the AMX N9206 2RU Rack Mount Cage. The AMX N9206 holds up to six cards for a clean rack mount installation and optional consolidated power supply. The AMX N2300 Series is expected to be available in November 2016.